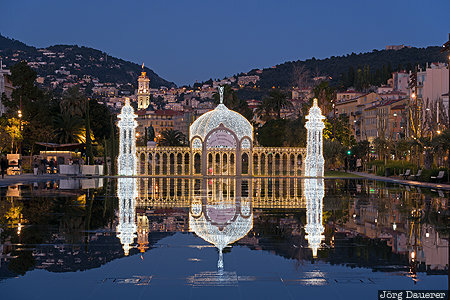 The water mirror at the Promenade du Paillon in Nice with the illuminated grid of a palace and its reflexions at the blue hour after sunset. Nice is in Provence-Alpes-Côte d'Azur in the south of France. This photo was taken in the evening of a sunny day in March of 2015. This photo was taken with a digital camera.